Power: 65W. DC Output: 19V 3.42A. AC Input: 100~240V / 50-60HZ. POWER CORD is included where applicable. Product Details. 85W Magsafe 1. Magsafe 1 Only Work for Macbook Pro 15" 17" since Jun.2012. Connector size :5Pins (L-Tip) magsafe 1. Power: 85W. MacBook 13" 1.83/2 GHz Core Duo. MacBook 13" 1.83/2.16 GHz Core 2 Duo. Aspire 5610 Series. Aspire 5600 Series. Aspire 5560 Series. Aspire 5540 Series. Aspire 5510 Series. Aspire 5500 Series. Aspire 5110 Series. Aspire 5100 Series. Output: DC 12V 1.5A. 90cm-100cm lead leaving plenty of length to get from a wall socket to your Device. Input: AC 100-240V, 50-60Hz. PERFECT MATCH. Genuinely Refurbished Macbook Pro charger 45w MagSafe 1 with "L" Shape Tip Refurbished using high quality compatible apple parts by Apple expert technician. Fully Tested Works Like New. Brand new Casing & wire. High Quality compatible parts and brand new casing is used to built these chargers. The Chargers looks Like new and works like new. Fully Tested & Working. PLEASE NOTE - THESE ARE REFURBISHED / REPAIRED CHARGERS. NOT ORIGINAL & NEW CHARGERS. A1286,A1290 ,A1297,A1343 ,A1222, A1172,A1229. 85W MagSafe 1. Power: 85W. 9D EDGE COVER Tempered Glass Screen Film Protector for APPLE iPhone XS X 5.8". 9D EDGE COVER Tempered Glass Screen Film Protector for APPLE iPhone XS Max. 65W AC Charger Adapter: For Microsoft Surface Book, Microsoft Surface Pro 3, Pro 4 ,Pro 5, Surface GO, and Surface Book/Book 2,Windows Tablet; Microsoft Model 1706. 1769 Automatic thermal, overload cut-off, and short circuit protection. Input Voltage: AC100-240V (Worldwide use); Output:15V 4A ,USB 5V 1A 65W, Come with 6Ft Power Cord Cable. Magnetic snap-in power adapter charges surface. the 65W Power Supply quickly recharges the battery, while the USB port allows you to charge another device at the same time Package Included: 1 x AC Charger Adapter 1 x Power Cord. Dell Inspiron 1150 Dell Precision M20. Dell Inspiron 1401 Dell Precision M60. Dell Inspiron 1501 Dell Vostro 1000. Dell Inspiron 1410 Dell Precision M65. Dell Inspiron 1420 Dell Precision M70. Dell Inspiron 1520 Dell Vostro 1400. DC Output: 19V - 4.7A. R18, R19, R20, R23, R25, R25 Plus, R45, R50, R510, R60, R60 Plus, R710, R519. Samsung A10 DXT 1000 A10 DXTD 1100 A10 XTC 1500. Samsung A10 DXT 1000, A10 DXTD 1100, A10 XTC 1500 . DC Output: 12V 2.58A. Power: 30W. POWER CORD is included where applicable. Connector Size: Thin Black Tip. Product Details. AC Input: 100~240V / 50-60HZ. Output Power: 18 W or below. Your RELIANCE and SUPPORTING are our great honor. We have the best aftersales service. There are NO EXCEPTIONS! Aspire One - 10.1". Aspire One AOD150-1739. Aspire One AOD150-1462. Aspire One AOD150-1322. Aspire One AOD150-1860. Aspire One AOD150-1669. Aspire One AOD150-1165. Aspire One AOD150-1577. Output DC connector: USB TYPE-C. DC Output : 5V-2.5A,9V-2.5A,15V-2.7A,20V-2.25A. Input: AC 100-240V 50-60Hz, Worldwide. Your reliance and supporting are our great honors. Max Power: 45 Watt. 1 X Free UK Fuse Power cord. A1435, A1465, A1436, A1466, MD223, MD224, MD231, MD232,MD592. 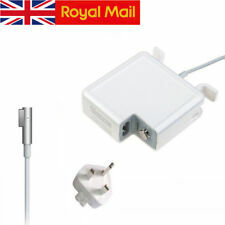 MagSafe 2 For Apple Macbook Air 11" 13" Mid 2012 to 2014. OutPut: 3.1A, 14.5V, 45W. 【Compatible With 】Apple MAC old MacBook Air 13.3" And 11.6" (After Mid 2012). Mode NO: A1435 A1436 A1465 A1466 TYPE NO:MD223,MD224,MD231,MD232,MD711,MD712,MD760,MD761,MJVM2,MJVP2,MJVE2,MJVG2,MQD32,42,52. Output 19V 4.74A 90W. Weight - 340g. It will work with any Lenovo device which uses the connector shown in the photograph which uses the 3.25A 65W adapter (this is shown on the adapter sticker or on the base of the laptop). If your item uses a weaker one (lower number) this will ALSO BE FINE! Output Watt: 65W. 1X AC Adapter 1X Free power cord. HP P/N 719309-001; P/N 719309-003; P/N 721092-001; P/N 740015-001; P/N 740015-002; P/N 740015-003; P/N 741727-001; P/N 741427-001; P/N A045R07DH; P/N HSTNN-DA35; P/N HSTNN-LA35; P/N HSTNN-CA40; P/N HSTNN-DA40; P/N HSTNN-LA40; P/N ADP-45WD B; P/N ADP-45FE B; P/N PA-1450-36HE; P/N PA-1650-32HE. Power: 45w. AC Input: 100~240V / 50-60HZ. Connector Size: 4.5 x 3.0mm. Quantity - 1. 20V - 2.25A. GENUINE LENOVO. AC ADAPTER. USED IN GOOD CONDITION HOWEVER. IS DIFFERENT! UK MAINLAND. IF OUT SIDE THE. UK MAINLAND ONLY. Product Type: Replacement AC Power Adaptor / Charger Colour: Black AC Input: 100~240V / 50-60HZ DC Output: 12V 2.58A Power: 30w Connector Size: Thin Black Tip. Compatible with Laptop Model Gateway Solo,M,4000 Series. Short Circuit Protection. Over Temperature Protection. 1x AC adapter. AcerNote / AcerNote Light Series. ADP-65HB,ADP-75FB-A,ADT-W61,API1AD43,K000000550,K000004120,K000005050,K000019570. Brand:Generic INPUT:100-240V 50-60HZ OUTPUT:19V 3.16A Connecter Size:5.5*3.3MM Compatible models: Sony PS4 VR Charger AC Adapter Power Supply CUH-ZAC1 ADP-36NH. Dell 130w Ac Adapter. Condition is New. Dispatched with Royal Mail 1st Class. Specification: Condition: Brand New Input: AC 100-240V, 50-60Hz Output: 19.5V 4.7A 90W Manufactured with the highest quality materials Built-in overload, over-voltage and short circuit protection High quality UL SA CE RoHS approved 100% compatibility with the original This product is good for the following Models and Part# 19v LG 32LH510B led tv Power supply adapter with UK mains cable 100% New Components - never refurbished, recycles, or used Non-OEM but 100% Compatible - Guaranteed to meet the specifications of your original device Nearly all our products have UL, CE and RoHS certificates. COMPATIBLE PART NOS 5U092, DF263, F7970, LA65NS0-00, PA-1650-06D3, LA65NS1-00, YD637, 0YD637, PA-1650-05D3, PA12, PA-12, PA 12 FAMILY. Dell Inspiron 1545, Dell Inspiron 1546, Dell Inspiron 1551, Dell Inspiron 1555, Dell Inspiron 1557. NX061 XK850 PA-21 PA21. Compatible Part Number Technical Specifications.